Apparently, Element is taking Go Skateboarding Day pretty literally. On June 19, 2009 Billabong’s skateboarding brand Element made some “cuts” to their work force and gave a few people a little more go skateboarding time. While the idea behind Toms Shoes is pretty cool (for every shoe they sell, they give one away) it seems like an odd thing for Element Skateboards to partner up with them because, we’ll you can’t skate in Tom’s shoes. Can you? The Toms and Element Skateboards line launches today with a collection of five styles of shoes –three for women and two for men. Also, Element has designed a Toms branded skateboard to push around on while wearing what else? Toms shoes. . . .Element will follow the Toms “one for one” rule — for every skate deck or board bought, Element will give a board away to a child in need of some wheels. . . . The shoes are all $46. Skateboards retail for $150 for a complete long board and $50 for the smaller deck. Guess you can longboard in pretty much anything. 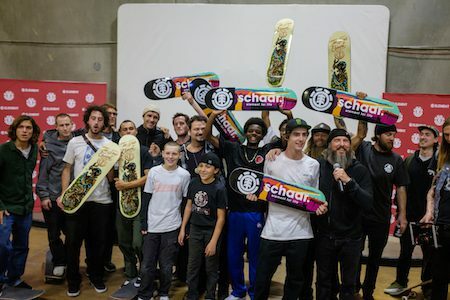 In 2018 Element Skateboards is passing out 300 skate camp scholarships to deserving skateboarders from around the world. And it all stems from founder Johnny Schillereff’s love of skate camp when he was growing up. How’s that for giving back to skateboarding by giving back to skateboarding? For the official word from Element, please follow the jump. Jon comes to Element after a 20-year tenure with adidas where he was most recently global head of product for Skateboarding and Snowboarding. Having been with the brand since their entry into the skateboarding industry, Jon has had several roles and led various businesses that broadened his experiences in both product and Go-To-Market planning and execution. Along the way, he helped craft strategy, lead both the apparel and footwear merchandising teams, worked across the business with design, sales, marketing and skate and snow teams to help bring the right concepts to market. Congrats all around. 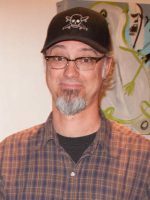 For the official word from Element and exactly how Johnny Schillereff feels about this new hire, please follow the jump. Tom Schaar has a pro model and it’s an Element Skateboard. It’s about time and it looks good. Welcome to the world of getting a slice, Tom. We hope it sells like . . . well, we hope it sells better than most. For photos from what appears to have been a great “surprise” night, follow the jump. What does “going pro” even mean in skateboarding these days? Does it mean the skater is finally getting paid? No. Does it mean they guy is competing in “pro contests”? No. After years of asking everyone we know what “going pro” means and getting a different answer each time we’ve finally figured it out. If you get a “pro model” anything and someone promotes you as having gone pro, then you’re pro. Take Julian Davidson for instance. Element just bumped him up to the “pro team” and gave him a “pro model” so the dude is pro. Period. Congrats, Julian. Mike Kershnar makes art wherever he goes. For real. Here’s just a little taste from the Element presentation of Field Notes (not to be confused with Field Notes). The guy pulls things together and it looks good. Guess that’s what artists do. Not wanting to be left out when it comes to authentic camp vibes, Element has partnered up with outdoor/camping company Kelty for a couple T-shirts and a pair of trunks. The Element Kelty collection was created to enjoy the peaks and valleys, and roads in between. 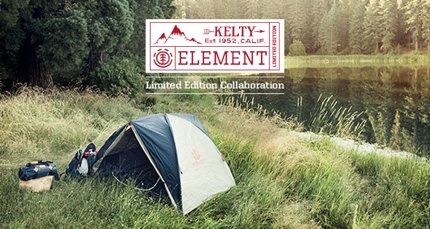 It’s been an honor for us to join Kelty on this adventure, creating new product on both our ends. From Kelty on board and in the streets, to Element in the field and camping out, the collaboration has reminded us all to keep discovering. IASC Executive Director Josh Friedberg is “proud” that a new iPhone app that he developed with Element and Medl Mobile is finally out in the wild. And we don’t blame him. The app is called Know Skateboarding and it features a quick and easy way to help new skateboarders learn the fundamental skills they’ll need to become great skateboarders. The app costs $4.99 and is available in the iTunes app store. Click here to check it out.